Almost all of the text herein was written a few months prior to my trip to Tripoli. It is part of a series of articles on Libya which I have been updating. It is fitting to conclude it in Tripoli, Libya. To be here on the ground in Libya is to be witness to the lies and warped narratives of the mainstream media and the governments. These lies have been used to justify this criminal military endeavour. In this conflict most of the propaganda, most of the lies, and most of the hatred have invariably come from people who are not actually involved in the fighting. Others have been used as their pawns and Libya as their battlefield. All the known advocates of Pentagon militarism and global empire demanded for this war to take place, including Paul Wolfowitz, John McCain, Joseph Lieberman, Elliott Abrahams, Leon Wieseltier, John Hannah, Robert Kagan, and William Kristol. Discussion with Mohammed Siala (Libyan Minister of International Cooperation), July 4, 2011. U.S. Senate Armed Services Committee, Testimony on the current, Op. cit. Lebanon and Syria are already members and Libya is an observer member. 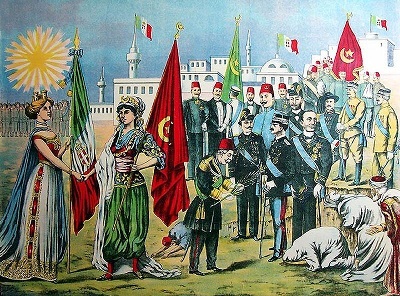 Libya was scheduled to become a full member, but Colonel Qaddafi changed his mind, which upset France and the European Union. U.S. Senate Armed Services Committee, Testimony on U.S. Transportation Command and U.S. Africa Command in review of the Defense Authorization Request for Fiscal Year 2012 and the Future Years Defense Program, 112th Congress, 2011, 1st Session, 7 April 2011..
 William Varner, “Libyan Rebel Council Forms Oil Company to Replace Qaddafi’s,” Bloomberg, March 22, 2011. 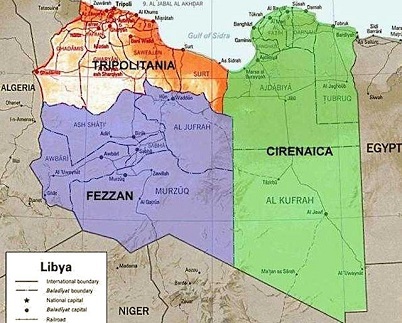 Al Jazeera, “Libyan rebels ‘disappointed’ by NATO, April 5, 2011; Atul Aneja, “Opposition allies mull ‘political solution’ in Libya,” The Hindu, April 8, 2011. Brian Murphy and Adam Schreck, “Libyan opposition says it has oil deal with Qatar,” Associated Press (AP), April 1, 2011. Scott Peterson, “Italy rejects Qaddafi, recognizes Libyan rebel government,” Christian Science Monitor, April 4, 2011. Daryna Krasnolutska and Agnes Lovasz, “North African and Mideast Democracy a Condition for EBRD Loans, Mirow Says,” Bollomberg, April 21, 2011. Alan Fisher, “Libya leaders talk exit strategy,” Al Jazeera, March 4, 2011. Kim Willsher, “Libya: Bernard-Henri Lévy dismisses criticism for leading France to conflict,” The Observer, March 27, 2011. Margaret Coker and Liz Rappaport, “Libya’s Goldman Dalliance Ends in Losses, Acrimony,” The Wall Street Journal (WSJ), May 31, 2011. The Daily Mail (U.K.), “U.S. rescue chopper shoots six Libyan villagers as they welcome pilots of downed Air Force jet,” March 22, 2011. Voice of America (VOA), “Berlusconi Opposes Libya Mission; Rome Cuts Involvement,” July 7, 2011. Agence-France Presse (AFP), “Nato capabilities will be exhausted within 90 days in Libya,” July 11, 2011. Agence-France Presse (AFP), “France backs ‘political solutions’ in Libya crisis,” July 11, 2011. Lamine Chikhi et al., “Italy’s Berlusconi exposes NATO rifts over Libya,” ed. Elizabeth Fullerton, Reuters, July 7, 2011; Nicolas Carey (who was expelled from Tripoli and managed to immediately reappear in Misurata) also contributed to this report. As a note the reporting of Carey has to be carefully scrutinized.